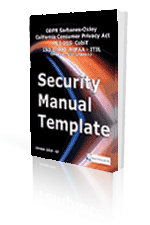 Security - How To Implement - The steps to implement a World Class security process are made easy with the Security Manual Template. End users are not security-conscious and do not think about the implications of their on-line activities. Over 3,000 organizations from over 100 countries have used this template to create their security environment. They have found the process one that is very manageable for companies of all sizes. The business impact analysis is an essential and often overlooked component of a solid IT security plan. This 28 page questionnaire walks you through the documentation process so management can understand the business risks and impact associated with each physical location, business function and IT application. As you go through this analysis, you will likely discover risk areas that you have not previously considered. Conversely, you are likely to miss critical risk areas if you do not conduct the essential step of methodically documenting all risk areas. Once you have documented and understand the various business risks, the next step is to conduct an objective evaluation of threats, risks and vulnerabilities in which assumptions and uncertainties are clearly considered and presented to management. In risk management, you need to have a good understanding of both the level of risk severity and the level of risk probability and how to use that understanding to best measure the overall risk your company faces. 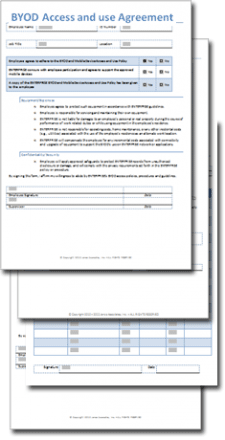 This 10-page Microsoft Word template and companion Excel workbook template will help you put everything into the right perspective so that your top security priorities receive the proper share of attention from management and ensure the “tail does not wag the dog”. This is where the “rubber meets the road” with your security plan. 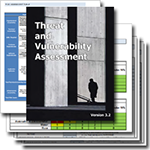 The known risks, threats and vulnerabilities discovered in the previous 2 steps are methodically documented in the template along with clear and specific language defining all aspects of security management including staff member roles, physical security, data storage, network security, contingency planning and more. 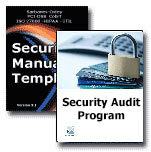 The manual also documents the policies and procedures for incident reporting, access control, and various other processes that relate to security.